The Mexican Model 1910 was the first Mexican Mauser produced in Mexico. 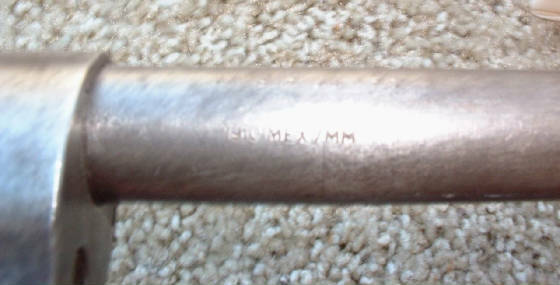 Dated 1931, Serial #8809, 7mm Mex. Stock has no splits or cracks and has "quarter sawn" apperance. The receiver and bolt has little rust and pitting and has a fairly shinny look. 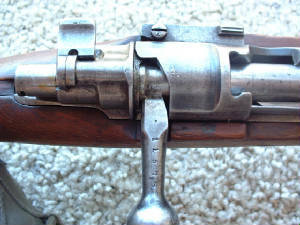 The bore has pitting and rust but still shows strong 4-grove right hand rifling. 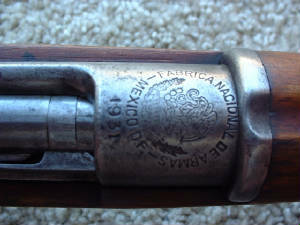 A fine crest of Mexico is stamped on the receiver, with the wording: "Fabrica Nacional De Armas Mexico D.F. 1931". The rifle seems to be in original condition, and does not appear to have been refurbished by Mexican arsenals. Adjustable leaf rear sight calibrated from 100 to 1800m. Missing the cleaning rod. Blue has turned to brownish color patina. The buttplate shows uniform brown patina. Smooth action. 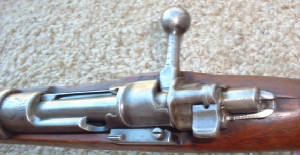 All the internal parts of the rifle are in fine condition, with some visible wear.